After a chilly start Wednesday morning, the Rio Grande Valley will warm up to the lower to mid 70s under mostly clear skies, according to the National Weather Service in Brownsville. 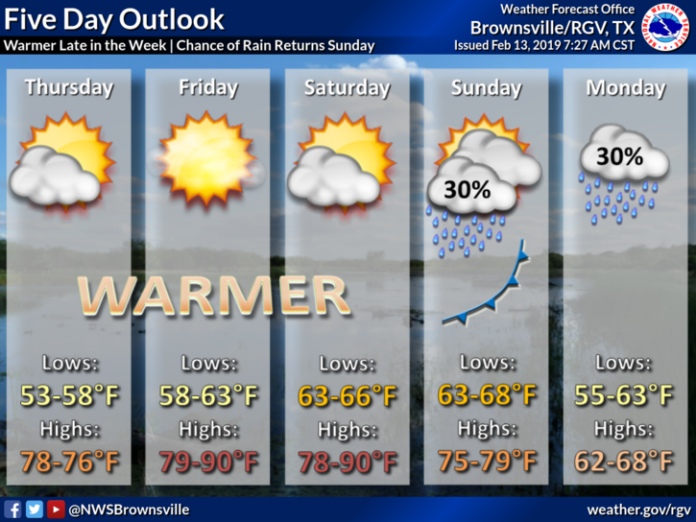 The expected temperature in McAllen will be 74, and Brownsville will see a high of 72. It will be cooler on the coast, as South Padre Island will reach a high of 66. The rest of the work week will be warm. There is a possibility some areas in the Valley will reach 90 degrees on Friday and Saturday.